The PCU1 series are medium powered primary current injection systems offering output currents up to 5000 amps. The system consists of a separate control unit containing all the metering and control functions and a loading unit that provides the high current output. 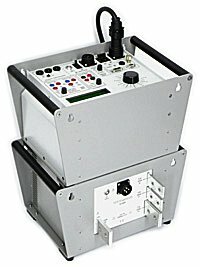 The PCU1-LT and PCU1-SP are ideally suited to primary current injection, stability testing and circuit breaker testing. In addition, the SP version offers direct-reading of CT ratio and polarity tests and a 100 Amp secondary injection output. Digital true RMS memory ammeter. 2000A and 5000A loading units. Three range outputs on loading units. Optional trolley mounting of system. Secondary injection up to 100A. Direct reading CT ratio and polarity. The control units are rated at 11.5kVA with a two second overload capability of 23kVA using pulse mode. All metering is digital and a memory facility is provided to hold the current reading when the output trips or is switched off. The current is switched by a solid state device and is automatically switched off when the device under test trips. The PCU1 systems have a high accuracy timing system, allowing timing tests to be carried out to a resolution of 1ms. Selection for normally closed contacts is automatic, and the status of the contacts is shown on the front panel. Timing modes are available to test under and over current devices, re-closers, under and over voltage devices, current trips and circuit breakers. A full range of high current output leads are available to complement the system in a range of lengths. Primary Current Injection System - Includes Operating manual, mains lead, spare fuse set, NLU2000 or NLU5000 loading unit, and metering leads.. Carrying accessory, includes space for both instrument and test leads.